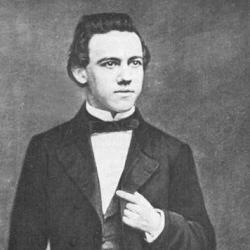 Paul Morphy was undoubtedly the best chess master in his time. In 1857, at the age of 20, he won a large tournament in the United States and followed that up with traveling to Europe. He attempted to play the European Champion, Howard Staunton in a match, but this never ended up working out. Instead, Morphy played every other strong player on the continent and usually ended up winning easily. He quit chess in 1859 because he had defeated all serious competition up to that point and had no one left to test him. He has less than 60 recorded “serious” games which shows the brevity of his playing career. The games that he did play were often extravagant and beautiful, outplaying and outclassing his opponents in every stage of the game. Morphy passed away on July 10, 1884.